Bloomsburg Fire Dept. - Retired Apparatus Many apparatus have served the Bloomsburg community since the inception of the frie service here in 1868. Below is a smattering of some pieces and some stories behind them. Many apparatus have served the Bloomsburg community since the inception of the frie service here in 1868. Below is a smattering of some pieces and some stories behind them. 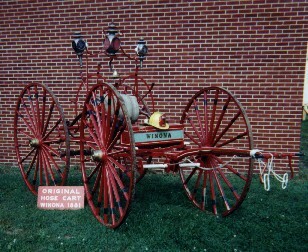 This original hose cart dates back to 1881 from the Winona Fire Co. #3 and is still on display in our entrance way off Market St. The haz-mat unit, used in the 1990's to respond to calls throughout Columbia, Montour, and Luzerne counties, was developed under the leadership of the late Dave Coombs, a former chief in the department. Bloomsburg's original ladder truck that was stationed at the Liberty Fire Hall. Prior to this, all ladders used were manual wooden ladders carried on the side of the engines. 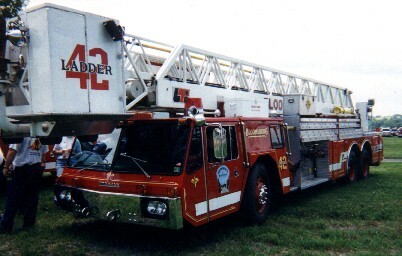 Ladder 42 went into service in 1980 and served Bloomsburg and the surrounding community for about 20 years. These were the apparatus that were stationed at the Friendship Fire Co. at the time of consolidation. The air truck was a converted bread delivery truck that gave the department 30+ years of service after its days of delivering subsistence. Engine 12 (at left) became our current Engine 24 and is still in service. Engine 33 was a 1974 Ford from the Winona Fire Co #3. The paint was a unique color because the workers, who were in the middle of a labor battle, had tried to sabotage the delivery and dropped a can of white paint into the then-common green paint source. 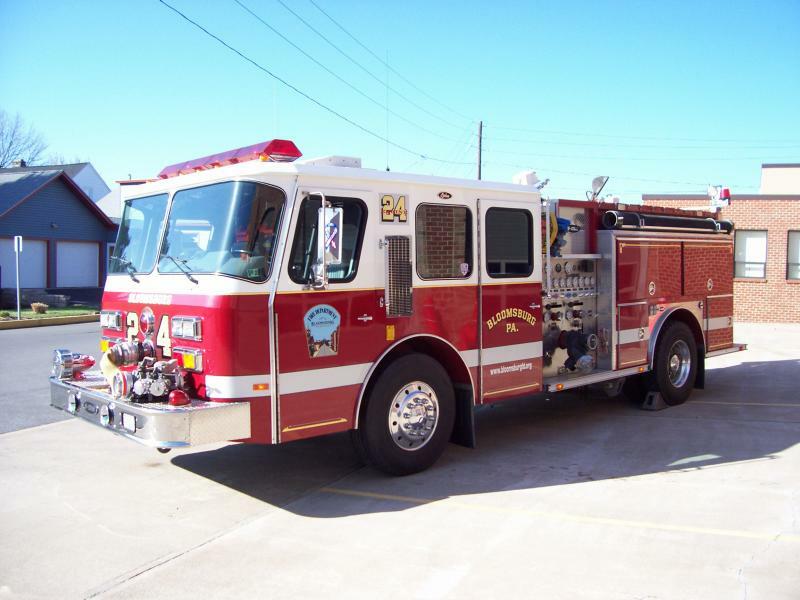 The town accepted the apparatus as it was and this engine spent many years in service. Engine 22 was housed at Rescue before the consolidation and was very often the first-due piece until its decommissioning in 2013.